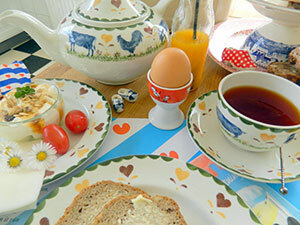 Your breakfast will be served in Wood&Sons china Jacks Farm. Coffee and tea will be served. Fresh orange juice, yoghurt with honey, bread, toast, marmelade and butter, tasty cheese from Holland, a fresh egg from our own chickens, Frisian sugared bread with cinnamon of the local backery’s and more will vary.